The Bank of Japan (日本銀行, Nippon Ginkō, BOJ, JASDAQ: 8301) is the central bank of Japan. The Bank is often called Nichigin (日銀) for short. It has its headquarters in Chūō, Tokyo. Following the passage of the Convertible Bank Note Regulations (May 1884), the Bank of Japan issued its first banknotes in 1885 (Meiji 18). Despite some small glitches—for example, it turned out that the konjac powder mixed in the paper to prevent counterfeiting made the bills a delicacy for rats—the run was largely successful. 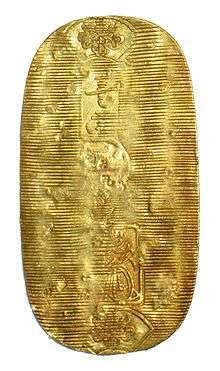 In 1897, Japan joined the gold standard, and in 1899 the former "national" banknotes were formally phased out. The Bank of Japan was reorganized in 1942 (fully only after May 1, 1942), under the Bank of Japan Act of 1942 (日本銀行法 昭和17年法律第67号), promulgated on February 24, 1942. 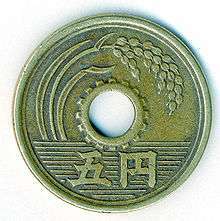 There was a brief post-war period during the Occupation of Japan when the bank's functions were suspended, and military currency was issued. 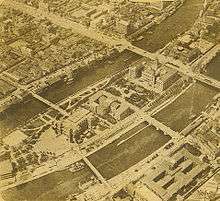 In 1949, the bank was again restructured. However, since the introduction of the new law, the Bank of Japan has rebuffed government requests to stimulate the economy. Following the election of Prime Minister Shinzō Abe, the Bank of Japan has, with Abe's urging, taken proactive steps to curb deflation in Japan. On October 30, 2012, The Bank of Japan announced that it has undertaken further monetary-easing action for the second time in a month. 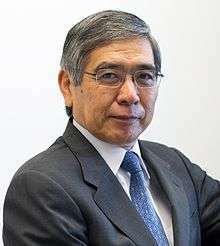 Under the leadership of new Governor Haruhiko Kuroda, the Bank of Japan released a statement on April 5, 2013 announcing that it would be purchasing securities and bonds at a rate of 60-70 trillion yen a year in an attempt to double Japan's money base in two years. By 2016 it was apparent three years of monetary easing had had little effect on deflation, and the Bank of Japan instigated a review of its monetary stimulus program. The Governor of the Bank of Japan (総裁, sōsai) has considerable influence on the economic policy of the Japanese government. Japanese lawmakers endorse the Bank of Japan Governor Haruhiko Kuroda. He is seen to adopt Reflation policy as part of Abenomics. ↑ "Bank of Japan Expands Asset-Purchase Program.". The Wall Street Journal. ↑ Riley, Charles (April 4, 2013). "Bank of Japan takes fight to deflation". CNN. ↑ Stanley White (31 July 2016). "'Helicopter monet' talk takes flight as Bank of Japan runs out of runway". The Japan Times. Reuters. Retrieved 1 August 2016. ↑ "Japan: The Great Reflation Play Of 2013". TheStreet.com. Retrieved 2013-03-21.